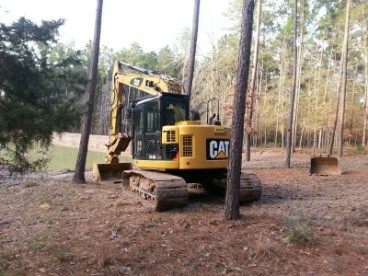 This machine is perfect for digging ponds, tanks, and even large ditches. 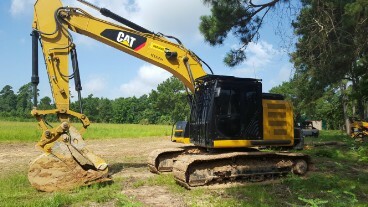 Our excavator is top of the line incorporated with a hydraulic thumb and a quick coupler. This mid-sized excavator is perfect for all sized jobs including tight quarter applications. This State of the Art equipment can meet the toughest of jobs with great success! Our most versatile tractor with 10 different attachments. 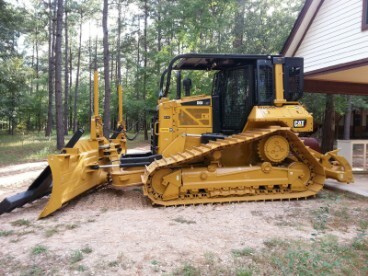 This Dozer is one of the finest heavy duty over protected top of the class dozers. 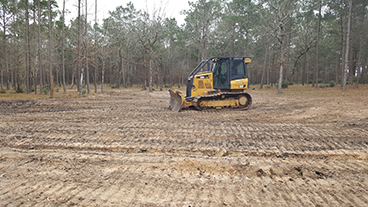 It is our finest piece of equipment for any large land clearing and beautiful large pond jobs in and surrounding the Houston area. No job is too big for this macho machine! Serviced and cleaned daily, as all of our machines are, for optimal productivity. 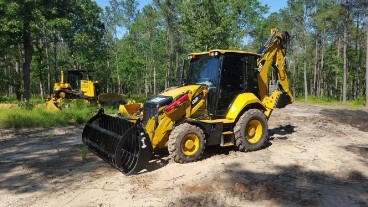 This Cat® Backhoe Loader provides superior digging, trenching, and back-filling capabilities. 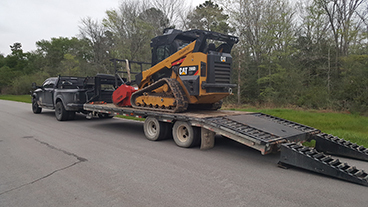 This backhoe has an intergrated quick coupler and can be interchanged with a clam shell grapple for moving brush, trees and logs with no problem OR use the yard and 1/2 loading bucket to move large amounts of material....dirt, brush, concrete, and much much more. This 4 wheel drive machine is one of the largest style backhoes that Catepillar makes. This heavy-duty piece of equipment conquers big jobs operated by our skilled crewman. 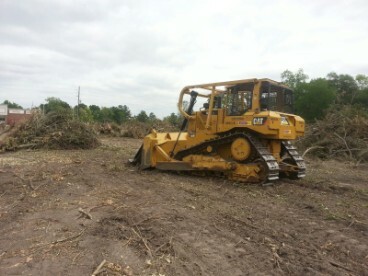 Heavy dirt moving, extremely thick land clearing, and big tree jobs in and around the Houston area are just a few of the jobs this intense machine is able to deliver amazing results with. There is NO job too big for this CAT. This heavy-duty mid-sized excavator contains a hydraulic thumb makes it easy to move objects both small and large. 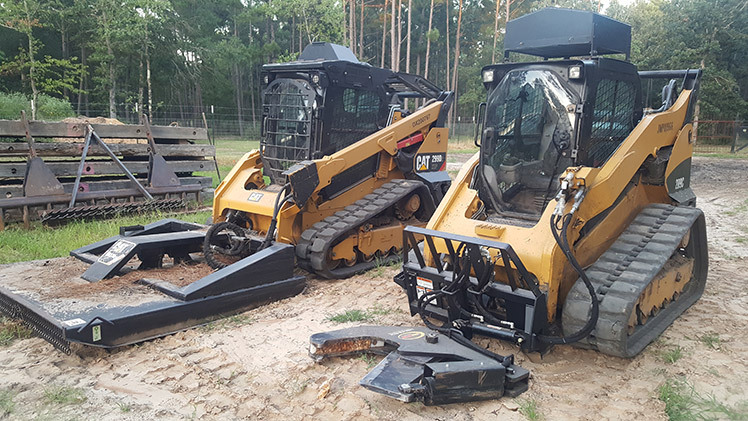 Loading dump trucks and logging trucks is a breeze for this Cat, allowing us to complete projects at a faster rate. Incorporates a quick coupler, enabling the use of many different attachments. This CAT is the perfect size for working on various sized projects in the most detailed of ways. Great for any sized lakes, tree removals, or loading projects and comes with attachments able to get the job done thoroughly and efficiently, no matter what. Powerbox rake attachment enhances final grading, lawn rejuvenation, driveway, and parking lot renovations, as well as seedbeds and ground preparations. Horsepower motor excellent for fast project completion. 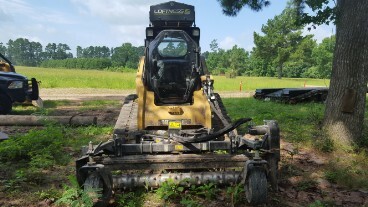 This mid-size cat dozer is ideal for any small or mid-size site work and clearing jobs in Houston and the surrounding areas. Excellent root raking and final grading. 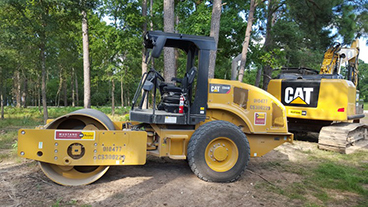 This machine is quick, efficient and is right for all land clearing projects in and around the Houston area. This Caterpillar track loader is the largest and most powerful compact that Caterpillar makes. 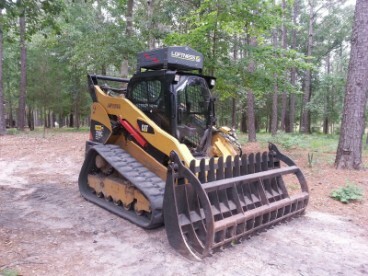 It accepts all ten of Texas Ace Land Clearing attachments and is suitable for even the most intense of projects. This machine encompasses a durability clearly seen in the quality of the projects it completes. This compactor services any building pad and all road compaction work. Built with versatility in mind, this machine packs a C4.4 Engine with Gross Power at 2200 rpm! This incredibly high powered machine efficiently consumes varied trees, up to 20 inches in diameter, in little to no time downsizing trees on even the largest track jobs. It is the go-to machine to use as an alternative to burning and hailing off debris from the designated site. Best alternative to burning and hauling off debris and material from site. 175 horsepower tree eating machine. Delivered to project sites in a single day. 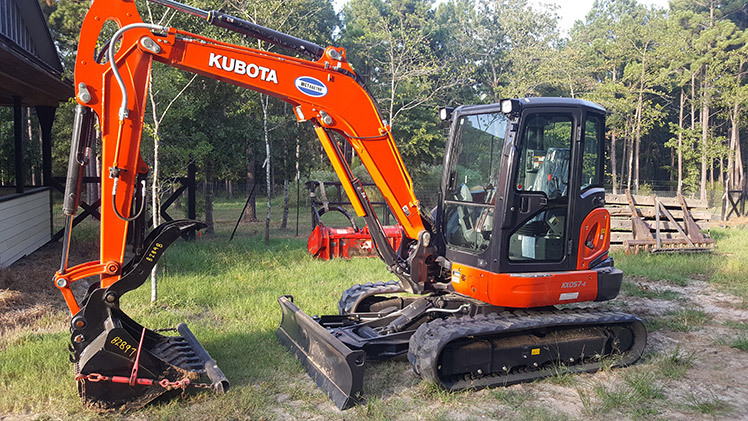 This 57 horsepower mini monster excavator may be the perfect small, compact vessel used for all kinds of trenching and tree removal or crunching, but delivers paradoxical work in power and precision. This machine comes in 3 bucket sizes (1 ft, 2ft, and 3ft) allowing flexibility to handle trenching jobs of all sorts. This high-tech, the sturdy machine cuts trees flushed to the ground with no need for stump grinding and can collect 3 to 4 trees at one time depending on their size. 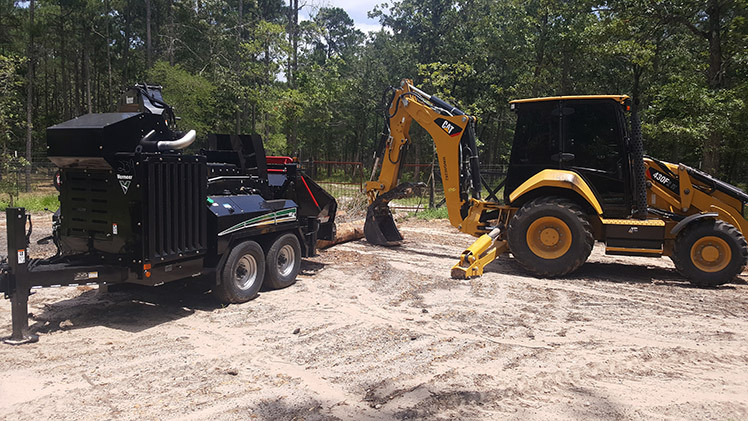 Containing a 14-inch capacity tree shear and grappler, this solid machine operates at maximum efficiency with every project allowing for easy cleanup and speedy operation.